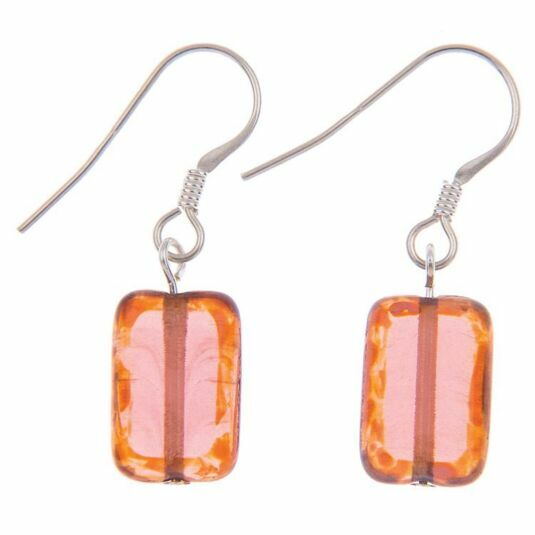 These lovely earrings from Carrie Elspeth are made from jewel like Czech glass in a semi-transparent soft shade of peach. The earrings can be worn for every day or a special occasion, perfect for enhancing a holiday outfit, to brighten an everyday outfit or wear on a special occasion. Combine with matching items to create a sophisticated look! These beautiful glass Czech rectangles in a muted rainbow design are perfect for every occasion. With various styles to choose from they are sure to be your show-stopper this spring. Beautiful items of jewellery in their own right, these earrings are also designed to work with the matching necklace and bracelet to bring the whole set together. The warm tone of these earrings is very attractive, and is tinged with touches of orange. Carrie Elspeth earrings always have sterling silver hooks for your comfort. Carrie Elspeth jewellery is sent in a smart Carrie Elspeth jewellery sleeve, and Carrie Elspeth gift boxes are also available separately in different sizes. You can also choose our ‘gift wrap’ option to make your purchase extra special. Check the Gift options available above.